Calabria, the toe of the boot in southern Italy, has four mountain ranges - the Aspromonte, Pollino, Sila, and Serra - with some of the highest mountain peaks in Italy. Lush dense vegetation, clear streams, lakes, and beautiful waterfalls grace these mountains, which are still perfectly wild and uncontaminated in many areas. The air is cooler here, of course, so a trip to the mountains on a hot summer day is a great relief. Walking, hiking, climbing, horseback riding, fishing, and biking are all viable activities in the Calabrian mountains. 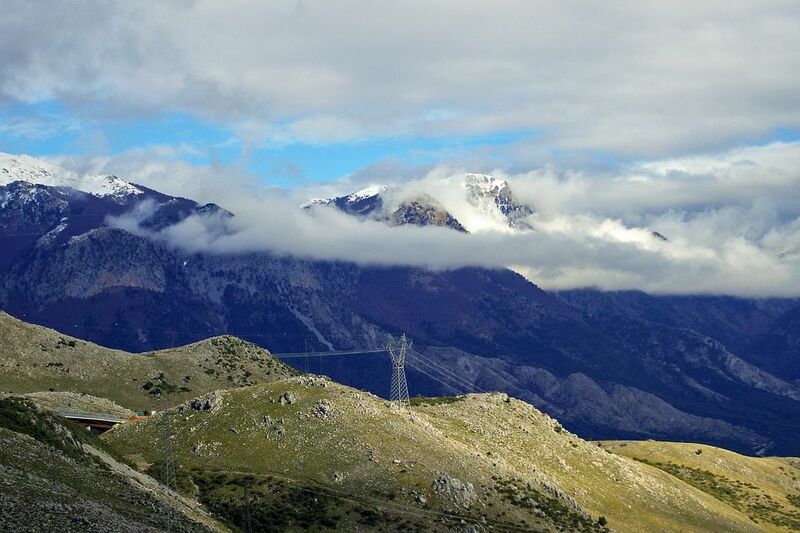 In the winter you can also cross country and downhill ski; the major ski areas are found in the Sila Grande. See the Calabria Map for the location of the national parks in the four mountain ranges. At the very tip of the toe of Italy, the Aspromonte Mountains are the southernmost portion of the Apennines and offer a unique opportunity, standing on a beach and on a ski slope within the same hour. Located near the sea, the Aspromonte National Park is made up of marine sediment thousands of years old and features sharp granite cliffs. Its tallest peaks are around 2000 meters (6500 feet) and the park is a giant pyramid with thick stretches of trees (beech, black pine, chestnut, and white fir), almost tropical vegetation, and many rivers. Wildlife includes the wolf, peregrine falcon, the royal owl, and the Bonelli eagle; the entire area is full of archaeological and artistic sites that show off the area's rich culture. The mountains are probably best known, though, as the home of 'Ndrangheta, the Calabrian mafia. Back when the group used to kidnap people for ransom, they would hide their prisoners in the Aspromonte. Although there is still organized crime in the area, the mountains no longer serve as such a refuge. Calabria's northernmost range is the Pollino Mountains with the highest peak reaching around 2250 meters (7500 feet). The Pollino National Park is located in both Calabria and neighboring Basilicata between the Ionian and Tyrrhenian Seas. In this park, you'll find beech trees, rare plant and animal species such as the Loricato Pine and the Royal Eagle, Dolomite-like rock formations, glacial deposits, and countless cave systems. Within its borders, the Pollino National Park hosts many paleontology and archaeology sites, including the Romito Caves and the Mercure Valley, as well as sanctuaries, convents, castles, and historical centers of the original Albanian settlers from the 15th and 16th centuries. Probably the least known of Calabria's mountains, the Serre range is famous for being home to an impressive amount of porcini mushrooms. Densely wooded with beech and oak trees, this area holds a wonderfully serene escape - the monastic complex in Serra San Bruno, founded by Saint Bruno of Cologne in 1090. The Carthusian monastery is still in operation and the complex offers a reproduction of the lives of its monks inside a nearby museum. Legend has it that one of the monks (now deceased) was a World War II veteran who, as an American airman, flew on the atomic bomb missions in Japan. The grounds provide an amazingly calm atmosphere in which you can visit its Santa Maria del Bosco church, the sepulcher of San Bruno, and a small reflecting pond that features a kneeling Saint Bruno, marking the spot where water sprouted up after the saint's bones had been dug up for placement in the abbey. The onsite restaurant in the complex features many delicious, authentic Calabrian dishes with porcini and also homemade ricotta cheese. The Sila massif is divided into three groups: the Sila Greca, Sila Grande, and Sila Piccola, and as its slogan confidently proclaims, "Its nature will amaze you." The Sila Greca is the northernmost section and is now mostly cultivated rather than thick woods. Around this area, you will find 15th-century Albanian villages such as San Demetrio Corone which sprang up when Albanians were fleeing the wrath of Muslim invaders. If you are around in late March, early April, mid-July, or late September, you can see a festival that features exquisite costumes and traditional singing in Albanian. The highest peaks in the whole range are found in this densely forested part of the Sila massif - Monte Scuro, Monte Curcio, and the tallest, Monte Botte Donato, which stands 1928 meters (6300 feet) tall. Calabria's major ski slopes call the Sila Grande home, but this range is also particularly well-suited for walking, hiking, and horseback riding in summer. Three artificial lakes made for hydroelectric power makes fishing another popular activity in this area. Situated in the Sila Grande but stretching into the Sila Greca is also a National Park complete with picnic spots, including La Fossiata. Foresta di Gariglione anchors this most densely forested part of all of Calabria with its fir, beech, and the gigantic turkey oak for which the woods are named. The southern tip of the Sila Piccola reaches Catanzaro and the Ionian Coast. Now a national park, the Sila Piccola is heavily protected and very sparsely populated, but two notable towns in the range are Belcastro and Taverna.